Earn $27.27 in Rewards credit (2727 points) What's This? The Roadhouse is Kona's flagship Reynolds 853 road bike, combining the lively ride characteristics and aesthetics of classic steel bikes with the all the details you’d expect from a modern road bike. 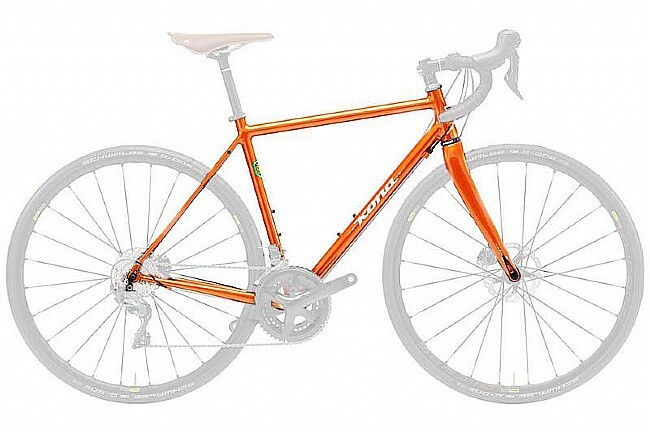 A tapered head tube and full carbon fork, flat mount discs, 12mm thru-axle wheel compatibility, and a metallic orange paint job set this bike apart. Frame material: Reynolds 853 Butted Cromoly. Available sizes (top tube length): 52, 54, 56, 58cm. Reach measurements by size: 52 : 373mm / 54 : 378mm / 56 : 381mm / 58 : 391mm. Head Tube measurements by size: 52 : 72º - 135mm / 54 : 72º - 155mm / 56 : 72º - 175mm / 58 : 72.5º - 195mm. Brake compatibility: Disc brake, flat mount.